You′re strongly determined to gain in popularity, build up a community, make money, etc. Getting straight to the point, your first step is keyword research. Never ever overlook this spadework. Though this step won′t appear interesting to do, I′ll give you a chance to make it as easy and fast as possible. 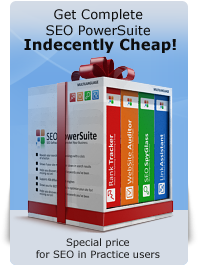 And, here′s my word: this task is your first and biggest chance to launch a 100% winning SEO campaign. Now come on, let′s make a flying start! The first thing you have to know is: No keyword research — no SEO. Why? Because keywords are the cornerstones of SEO. And, trying to promote a website without having the right keywords brings no results. See the image below. I guess the message is clear. It′s like trying to find a buried treasure without knowing where exactly it′s hidden. Think of a situation like this: you know there′re heaps of pure golden coins and shining diamonds buried on an island, but the old pirate map you have is half burnt, and you just can′t find the right place on it. So you can dig the ground as deep as you wish, but you won′t get a grain of gold. Now what′s the bright side of it? The right keywords are the best investment in SEO. It′s the case when money doesn′t matter. Think of this: if you have 5 great keywords, your chances to make a fortune are huge. And if you have 5 thousand dollars, you still need the 5 great keywords. ;). Of course, the number can be bigger. You may just start with 5 and as your rankings improve and the website grows you′ll simply add more keywords and expand the campaign. 100% sure, with this guide you′ll pick out really good keywords, use them at really right time — and turn them into really big money. Once again, the thing I know for sure is: if you do what the book says, there′s no way to fail SEO. Now, don′t waste your time, go ahead! So what′s a keyword for SEO? This is a word people will type in Google, Yahoo! or other Search Engine to look for products or services they need and you offer. Before I give you my example, meet my son Mike. His girlfriend gave him an iPod for his 19th birthday, 3 weeks ago. Today Mike′s going to buy new headphones and makes a query in Google, typing in headphones. Now, if he sees your site at the very top of the Search Engine′s results page, this means that you rank first for the keyword headphones. Also, it means that Mike is much more likely to visit your site and buy from it, than from a competitor′s site that has a #4 ranking. We can make queries using one or several words, like, headphones, iPod headphones or buy headphones. Terms for query that contain several words are sometimes called keyphrases. So iPod headphones is a two-keyword keyphrase. So to get a #1 placement in Search Engines, the first and the most important step is to choose the right keywords and keyphrases for which you want to rank first. Why do I call this step the most important? I′m often asked: "Why think so much of keywords?" The answer comes together with experience. Keywords are the crucial starting point of any SEO campaign. They are the material an SEO works with. Just like a cook can′t make an apple pie with wrong fruit, or a potter can′t make a plate with bad clay, an SEO can′t make a website succeed with wrong keywords. Pick the good keywords, and you′re half-way to success. Get the wrong ones — and you′ll make a dog′s dinner of the whole campaign. For over 6 years, a friend of mine has been a webmaster of a big European online bookstore (you can guess the name easily, if you wish ;)). Quite long ago, he nearly failed a $90.000-worth optimizing campaign. Everything looked fine at a first glance: the site was ranking high for certain keyphrases, and the SEO department′s done a big job. But they just weren′t selling, because some words weren′t bringing traffic to the site, and others brought traffic but didn′t make sale or, SEO speaking, convert. You guess where the problem is? Yep, the keywords were wrong! Luckily, they had enough time to sort it out and save their bottoms. Sure, when you get done with this step, you won′t see any effect on your website′s traffic. But the keywords you′ll single out will be critical for the greater part of your future optimization work, be it on-page optimization, video syndication, guest blogging, social media activities, directories submit, or other. But let′s not leap ahead. I′ll put prior things first. What does ROI mean you may ask. Well, ROI (return on investment) — shows how much profit you′ve made compared to how much you′ve spent to get this profit. As you see, mid-size keyphrases give you maximum chances of quick profit. 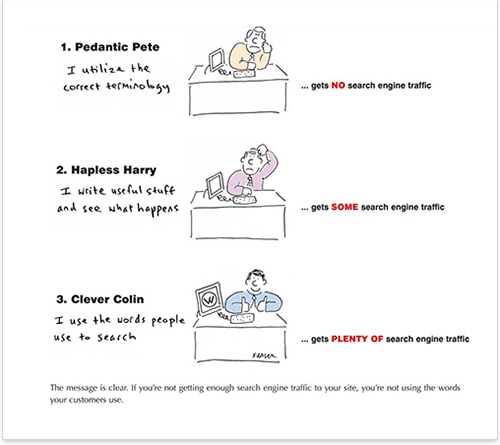 When people make searches in Google or other Search Engines, most often they type in 2-word phrases, and just a bit less often 3-word phrases. 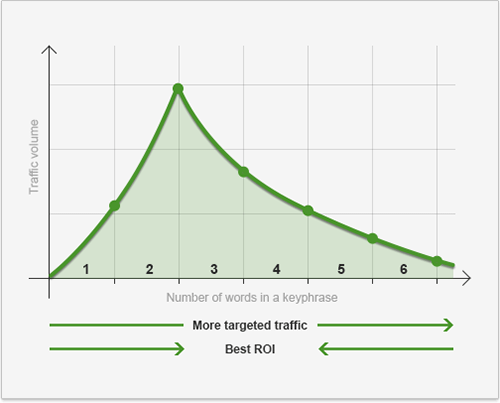 1-word phrases (or so-called short-tail keywords) make up less than 30% of searches on the web, and if the keyphrase is longer than 3 (so-called long-tail keywords), it gets fewer uses, with each word added. So in general, if you choose long keyphrases, you′re getting less traffic. But don′t jump to conclusions yet! Let′s first talk about targeted traffic. Please think of this: if a person types in headphones, who can guess what exactly one expects to find? Say, my son is in fact interested in inexpensive headphones for running, and you sell professional stereo headphones. So Mike comes to your website, maybe thinks it′s well designed — and hits the back button in his browser. But what if he were looking for 900 MHz wireless stereo headphones and would type it in Yahoo!? If you sell this kind of headphones, then your chances to get Mike as a purchaser would at least double — and this happens with any visitor. Here′s what we call targeted traffic: people come to your website because they are looking for what you offer. If they type in a search term, find your site, come to it and buy — this means that the search term they used converts. If they come to your site after the search, look it through and leave — the keyword does not convert. You only get a visit, but not a sale. So remember: you need keyphrases that convert. Now look at the diagram once again. You see an arrow at the bottom and it says there "More targeted traffic and faster results". Here′s what this means: normally, the longer and the more precise your keyphrases are, the sooner you′ll get your traffic. Why? Because it′s easier to optimize a site and rank for a unique phrase with little competition. So here′s the summary: it′s rather hard and not wise to get to the top with a single-word or rather broad-sense keyphrase. The longer and more precise your keyphrase is, the fewer visitors you get, but the more targeted your traffic is. The narrower the search term you target, the greater part of visitors convert into real customers. My recommendation is: try to find the golden mean. If you′re not sure, start with two- or three-word keyphrases that better reflect your customer′s needs. When a user enters an informational keyword, you can′t say for sure what he′s driven by and what his intention is. He may be looking for a company description from Wikipedia, checking the range of Sony products, etc. Most important is the fact that he is NOT likely to buy something right now. In contrast, with "sony headphones discount la"-type of keyword, you can be pretty sure that this user really wants to buy Sony headphones and is therefore looking for special offers in Los Angeles stores. There are also mixed types of keywords like, for example "sony vs panasonic headphones reviews", which indicate that a user is interested in buying headphones, but hasn′t made up his mind yet. Such keywords provide a good opportunity to enrich your content and dilute the density of transactional keywords. And now we′re going straight to keyword research. Hello I'm Sherry, and I have 2.2 websites out there, but I'm getting 0 on sales. I have a lot of comments of people liking my writings, but no sales. I'm wondering should I have used the product name as my site? Or the product name as my keyword? Hi Dan, Greetings from Australia. Can you advise if this guide has been updated to incorporate the changes made by Google in the Penguin and Panda updates. My understanding that too many keywords would be penalised and therefore your suggestion to copy your competitors might be flawed. Hello Liz. Yes, you are right, overusing and stuffing the keywords in different elements of webpages and anchor text can bring negative effect according to Google rules. But what I was talking about is the competitors research, which a very effective thing especially for those who just starts doing SEO. This doesn't mean that you should copy your competitors keywords or content, but discover how they organized their websites to get on the top of Google. Thanks Dan for clarifying that. I am really enjoying the course and using your software for the first time - making things so much easier too. Wow really I like it,thanks my friend. I think many people are looking for the PDF version. We're willing to buy it PDF version too, you deserve it. Hi Dan - I too would welcome a PDF version of the book! We take a lot of long car rides and I love reading outdoors. Any plans to offer a pdf version? Currently we are not planning to introduce off-line PDF version of this guide. In case we are doing it, we will let you know via e-mail. wow thanks and greetings from vietnam!!! Thanks and greetings from México!!!! Great book I am looking forward for the PDF version!!! Thank you so much for the infos provided.